The Bridport Arms Hotel in Dorset is a perfect getaway for those seeking a Jurassic coast hotel right on the beach at West Bay near Bridport in Dorset, as featured in the ITV drama Broadchurch. Broadchurch hotel surroundings, spectacular cliff top views and the harbour setting all now form part of the Broadchurch Trail in West Bay. Taste fantastic fish and seafood at this superb hotel restaurant which also boasts a wide selection of other cuisines on the lunch and dinner menus. The Bridport Arms Hotel also has conference facilities that can be hired for work meetings or conferences with free WIFI. The hotel accomodation is modern and stylish with twin or double bedded rooms to choose from. The suite, four poster and split level rooms offer quirky pub accomodation features in the style of 16th Century pub rooms. This Bridport hotels amenities are perfect for business or pleasure, with en-suite rooms, bars, a superb restaurant and a beach location that will take your breath away. Visitors to the Bridport hotel can explore the coastline on fossil hunting walks, take a fishing trip around the bay or enjoy the relaxing views that a beach hotel has to offer. Located in Bridport on the coast of Dorset, the West Bay hotel boasts its own popular seafood restaurant where guests can enjoy fine food from the lunch, dinner or seasonal menus offered. Non-residents are welcome to wine and dine on good pub food in their bar and hotel fish restaurant. 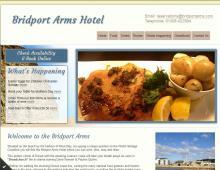 The Bridport Arms Hotel look forward to welcoming you soon.